Solar charger(10000mAh capacity) is for emergency use, not a main charging resource, it takes about 40h to fully charge under direct sunlight, so it is recommended to charge by wall charger. Two USB output can charge two devices at the same time, also compatible with most 5V USB-Charged devices such as iPhone, Gopro Camera, GPS and Bluetooth Speaker. 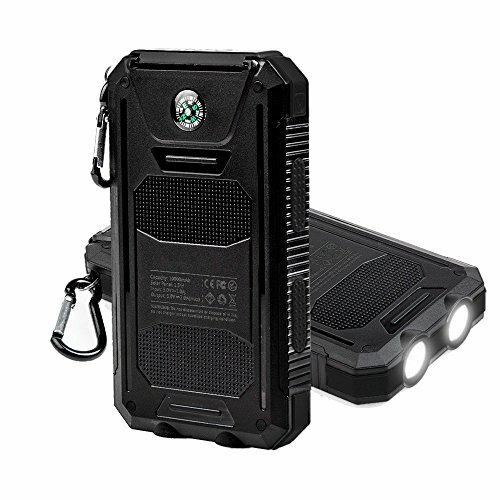 【10000mah HIGH Capacity 】: With Built-in lithium battery equipped with compact solar panel, it could recharge the battery itself under sunlight for emergency purpose. It can charge iPhone and Sumsang Galaxy Phone more than three times, and is suitable for wide range of occasions like BBQ, camping and outdoor activities. 【Dual USB Charger Ports】: 2.1A USB port for iPad/Tablets. 1.0A USB ports for smartphone or other devices; can fast charge two devices simultaneously, support all digital electronic devices with 5V/1A-2.1A input. 【Powerful LED light & Built-in Compass】: It comes with two light modes (Steady light / Rapid strobe). Simply long press switch button for steady light. Press again for rapid strobe or SOS when in dark and emergency environment. With built-in Smart Compass on the back surface, it'll be very helpful if got lost in outdoors. If you have any questions about this product by StarVast, contact us by completing and submitting the form below. If you are looking for a specif part number, please include it with your message.